We hope you'll spend some time here and learn about the biology and natural history of these amazing insects. You'll meet many of the species of dragonflies and damselflies that call Manitoba home. Select a page to fly to below! This site is rich in photographic images. If you have a slower internet access, please be patient. Navigation links are at the bottom of each page. There are many "clickable" thumbnail images that will load larger images or video clips in a popup window. Make sure your browser is set to allow popups for this site. You will need Adobe Flash and Quicktime Video browser plugins to fully enjoy the Dragonflies of Manitoba. 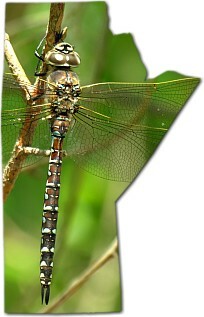 The Dragonflies of Manitoba was produced with funding from Manitoba's Special Conservation Fund and Sustainable Development Innovations Fund. View our complete Credits Page: CLICK HERE.